Able to draw tall buildings in a single book…. Check out a new interview I did with SuperheroYou.com. I’m long-winded so they published it in two parts. Here’s part one and here’s part two. Next Post Why men don’t take art classes. I think this is your best interview yet…great questions and thoughtful and wise answers. Thanks for your writings, art, etc. Wondering if you have read “Embracing Your Inner Critic” by Hal Stone & Sidra Stone. I have had the book for quite a while, however, I plan on re-reading it after reading your 2-part interview. I think it is about taming that monkey instead of fighting it. I love your honesty. It is refreshing and makes you authentic. I am voting for you to be President of the “Creatives of Planet Earth” ! Definitely an amazing interview. People who meditate learn about that inner monkey, but for creative people that monkey can chatter on endlessly about “lack of talent” or ” I will never be as good as so-and-so so why bother” etc. The little I have read of your book, and the what you address in this interview already give me ways to shut my monkey up. Here is the thing ( you talk about it too) we have to train our minds (That Monkey!) to be quiet and change negative thinking, which takes work, ongoing work. But once we train ourselves, it becomes easier to shift gears when we do hear that negative voice. 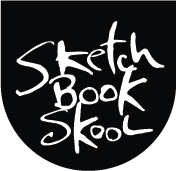 Thank you Danny Gregory, and I am loving Sketchbook Skool. I have never been able to maintain a sketchbook on a regular basis before and all of this has helped me immensely. And lastly – I love that you say we can be superheroes just by helping someone else. That is what life is about, helping others, community, caring….